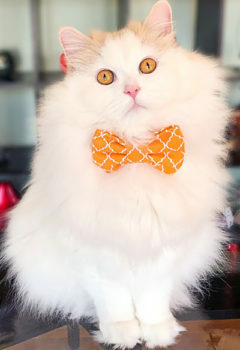 Louie is a super floofy Persian/Turkish Van mix who is as sweet as he looks. Adopted from a Boston area shelter, this gentle giant loves attention from everyone and is extremly outgoing and friendly. He will go out of his way to make sure every new person around stops to pat him. Louie loves to go outside on his leash exploring and run all over the house playing. He’s a great example of pure love. You never know what amazing little one you’re going to find waiting for you inside a shelter.